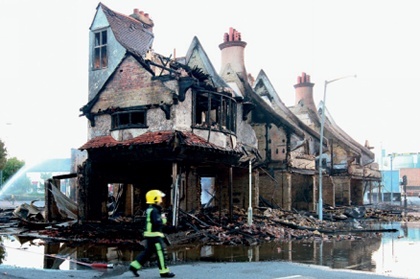 Fire is the most destructive and alarming thing that can happen to a historic building and has resulted in the destruction of many listed buildings, from terraces to palace apartments. Recent examples have been widely studied and well publicised. Based on this work, a number of useful observations can be made that should promote cost-effective early refurbishment of fire-damaged buildings with the maximum retention of original fabric. In the UK, fires brought under control by the local fire brigade may be treated as a potential crime scene. Access to the affected building may therefore be strictly controlled until the authorities have completed their work, but a number of measures can be taken. Obviously the insurer should be contacted as a matter of urgency so that a loss adjuster can be appointed, but uncertainty over insurance cover can result in delays in this critical period, postponing refurbishment and re-occupancy, and resulting in further loss of historic fabric. It is therefore important for the building owner or manager to take all reasonable measures to mitigate these losses ahead of any final settlement. Consideration should be given to obtaining independent specialist advice as soon as possible, and the insurers should be advised of all measures being undertaken ahead of any settlement. It is important to keep all key information on site, from the contact details of the fire brigade and local authorities, to the contacts with insurers or loss adjusters and the condition of structures and materials. Fortunately the general availability of digital cameras and email will help in this. Backup records should also be rigorously maintained and stored off site. The factors to be considered in planning remedial measures include structural stability, safe access, electrical safety, contamination by hazardous materials such as asbestos, and water penetration. It is also important to contact the local planning and conservation authorities as soon as possible for advice. Keeping them informed will help to ease the process of obtaining listed building consent when necessary. Far more damage is caused to a historic building by water penetration into the building during and after a fire than is caused by the fire alone. Not only does this water cause physical and chemical damage to materials, it also provides the conditions for decay and mould growth during and after refurbishment. The control of water penetration, the removal of damp materials and the drying out of the structure are therefore the most important factors in the cost-effective conservation, refurbishment and early re-occupancy of the building. Unfortunately, most of the existing measures for controlling water penetration into buildings, roofs and roof drainage systems are destroyed or compromised by fire. Water penetration should therefore be controlled as a matter of urgency using the measures highlighted in the checklist below. disconnect and drain down any water pipes on site. if required, consider the installation of accelerated-drying machinery (the use of indirect heaters, high capacity desiccant dehumidifiers, tenting and fans is recommended but should be specified by an independent specialist); and consider the use of mechanical ventilation systems (the cost of both electrical power and the specialist on-site supervision required to accelerate drying successfully is always a limiting factor). Fires can result in the production or exposure of hazardous materials, and a fire-damaged historic building may contain residues of asbestos, lead oxides, chromium, nickel and arsenic, as well as combustion products from more modern materials such as dioxins and isocyanates. These will form potentially hazardous dust particles and must be removed from the building and disposed of in accordance with current health and safety regulations, prior to any accelerated drying measures. Independent specialist professional advice will be required to identify any significant hazards from materials such as these, as well as from hazardous spores and other metabolites introduced by mould growth. Failure to specify appropriate risk management measures can result in significant hazards to health during and after refurbishment, causing delays to the refurbishment programme and even affecting the capital value of the building. Many thousands of litres of water can penetrate into a building during and after a fire, and drying out the structure can create ideal conditions for mould growth and decay. The techniques to be used must therefore be carefully considered to ensure that the process is both cost-effective and efficient. It is particularly important to identify all areas of residual moisture in the building by taking moisture profiles through representative structures, and to provide through- and cross-ventilation into all affected areas and building voids. Specialist accelerated drying measures such as the use of dehumidifiers provided by specialist sub-contractors are often used. However, the equipment is often poorly specified and improperly used, resulting in little or no accelerated drying and causing unnecessary delays. If not properly managed, damp and decay problems can persist for many years after a fire, and fungal or mould growth can result in health hazards to occupants and/or the unnecessary loss of original fabric and structures. Conversely, appropriate measures as outlined in the prioritised checklist of drying measures, can allow refurbishment in less than six months, even after the most severe fires. It should be noted that accelerated drying in the UK is more cost-effective in the winter and early spring and very much harder in the summer months due to the external air being relatively warm and moisture laden. Timely and appropriate advice can therefore make a difference of over six months in a refurbishment programme. 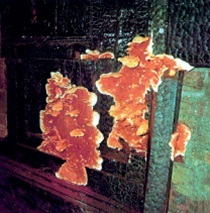 Water penetration during and after a fire can produce the ideal conditions for infection and decay by dry rot (Serpula lacrymans) or the related Donkiopoira expansa, which often decays oak. This is often the result of the reactivation of pre-existing infections beneath valley gutters or other vulnerable roof drainage details. No chemical remedial timber treatments or wall irrigations should be required. However, all timbers built in contact with damp or potentially damp structures should be investigated by an independent expert to determine their decay state and deep moisture content, in conjunction with the moisture profiling described above. Appropriate repairs and/or accelerated drying measures can then be undertaken. These may include the isolation of vulnerable materials from damp structures with damp-proof materials and/or through-ventilated air-gaps, so as to allow long-term drying after re-occupancy. A policy of radical remedial exposure is often the most cost-effective way of conserving the maximum amount of historic material. For example the early lifting and removal of panelling, skirtings and floor boards and the early removal of salt- and water-damaged plaster and pugging materials should be considered. This requires that the conservation authorities are kept closely involved and that listed building consent is obtained as necessary. It is also important to employ appropriately skilled craftsmen, and to set up a robust and well managed system of recording and storage. An advantage of this approach is that valuable information on the history and archaeology of the building is often discovered, allowing previously unknown features to be conserved and incorporated into the refurbished building. TIM HUTTON MA MSc VetMB MRCVS is a building pathologist and environmental scientist, and the CEO and scientific director of Hutton + Rostron Environmental Investigations Limited. 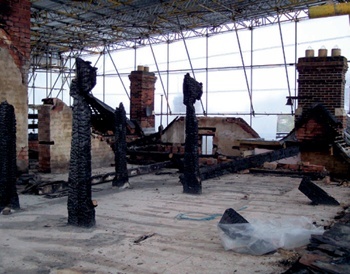 H+R has provided specialist independent advice after fire to occupants and insurers of all types of buildings for over 30 years, including after the fires at Hampton Court Palace and Windsor Castle.